The picture above shows Vincent Bolloré (left), who owns the company which builds the electric Bluecar and Autolib, the company which operates a fleet of those as a car-sharing service in Paris. Right is Carlos Ghosn, CEO of Renault-Nissan, the world’s leader of electric mobility. The two men have signed a 3-point partership, which includes several surprises. 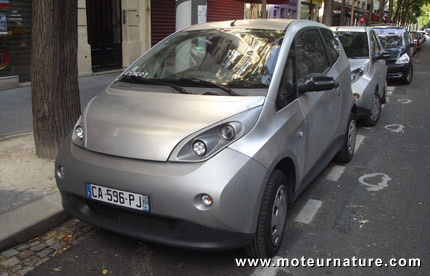 The first one is about the current Bluecar, which is all over Paris thanks to Autolib (pictured below). All Bluecars so far have been built in Italy, but starting from 2016, Renault will build them in its factory in Dieppe. It’s a surprise because that factory was rumored to build the next Alpine. It turns out that the two cars, while totally different (a powerful gas sports car and an electric city car) will be built alongside. No synergy will be possible, but this could be positive news as the current Bluecar suffers from terrible build quality. Renault may make it better. 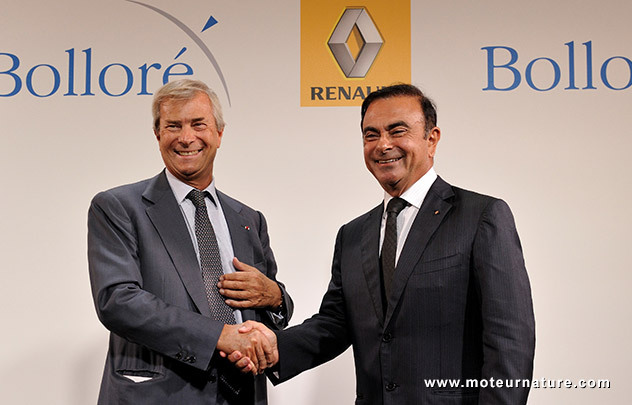 Renault and Bolloré are also joining forces in a new company (70% owned by Bolloré and 30% by Renault) with the goal of selling complete turn-key car-sharing solutions. Any large city interested? The most surprising news though, is that Renault will develop a new generation of the Bluecar. This will be a 3-seater, with a 20-kWh lithium-metal-polymer battery (LMP), just like in the actual Bluecar, only slightly smaller, and that’s bad. The Bluecar would be a pipe, it would be a leaky one. The LMP battery technology, whose characteristics were kept secret before the Autolib service started, has lost all its supporters since then. The Autolib car sharing service wastes megawatt hours of energy not to move Parisians, but to keep the LMP batteries in all Bluecars at their high operating temperature. Leave a Bluecar parked unplugged and its battery cools down and gets totally discharged in 48 hours! This technology should disappear, but quite to the contrary, it now officially enters Renault’s doors. Hopefully, Renault hasn’t committed itself to the technology. Renault shall develop a new EV around LMP battery, it may even build it, but nobody said it will carry its badge.